1. In a frying pan over medium-high heat sprinkle chicken with spices and cook the chicken thighs through, let them rest and finally cut into strips. 2. Cut all the vegetables and set aside the bell peppers and green onions in a bowl. 3. Over medium-high heat and pour olive oil into skillet and sauté the tomatoes and mushrooms until most of the liquid is gone. 4. In the last few minutes of cooking add in BBQ sauce to taste and incorporate. 5. Using a clean frying pan the size of the tortilla, start toasting as many tortillas as needed and set aside on a plate. 6. Once all tortillas have been toasted place one back on the frying pan and add in a mixture of chicken, cheese and all the vegetables. 7. 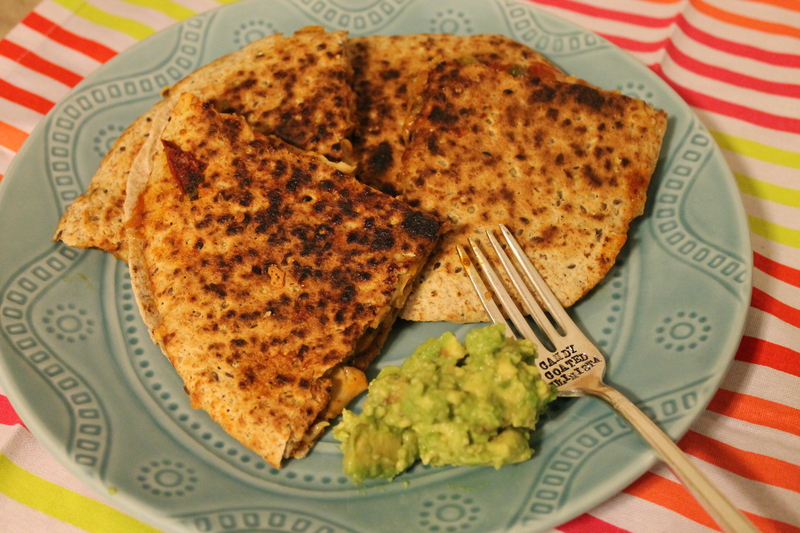 Cook and flip at least once until tortilla in crispy and cheese is melted. 8. Cut into quarters and serve with guacamole on the side. This isn’t a really great dish to look at but it tastes amazing. I even made them the next day again with the leftovers.